Hot Sauce → Habanero → Marie Sharp's Fiery Habanero Pepper Sauce 10 oz. 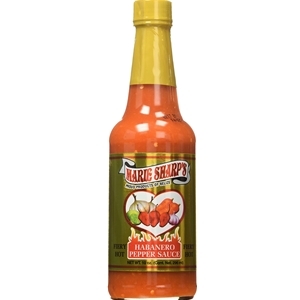 Marie Sharp Fiery Habanero Pepper Sauce is the original habanero sauce from Belize. Marie Sharp's combines the world's hottest peppers with carrots, onions, lime juice and vinegar for a delicious flavor that blends wonderfully in soups, stews, chili, and on meats and seafood. So many hot sauce options out there. This is the best tasting I have tried. Just. Enough heat but not too much and great flavour. The best tasting habanero pepper sauce of the many I have tried.